Master Sergeant Rich Johnson is the Benny Havens Band multi-instrumentalist, covering banjo, pedal steel, keys, and electronics. 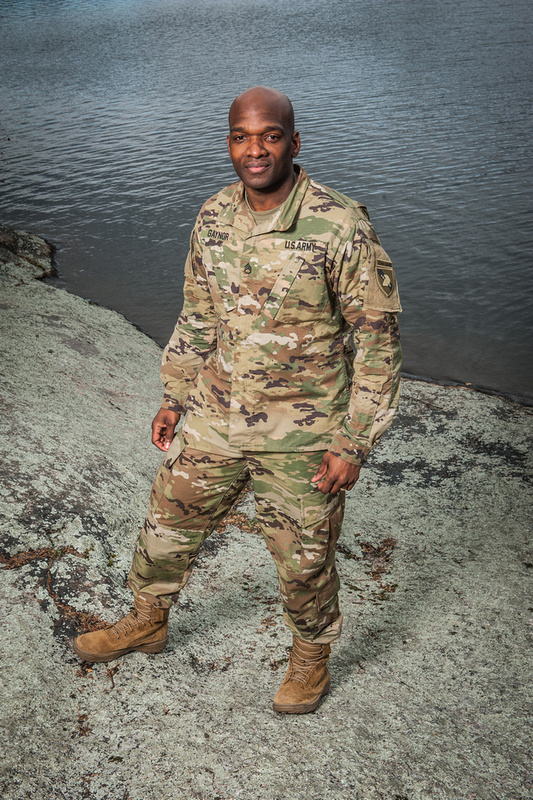 A member of the West Point Band since 2003, he is proud to help carry on the great tradition of Army bands entertaining and inspiring troops, veterans, and the American public. When he isn’t programming beats or working on the latest pedal steel solo, he enjoys shredding on the local ski hill or fishing on one of West Point’s lakes. So many people have helped along the way. George Hitt, Byron Stripling, and Laurie Frink on trumpet, John Widgren and Steve Hinson on pedal steel, Tony Trishka on banjo — these are just a few folks who have helped me on my path. Programming the inner workings of the Benny Havens Band setup on laptop. Diving deeper into social media as the Social Media NCOIC for the unit. Keeping up my banjo chops. Learning the pedal steel guitar parts for the Benny Havens Band’s new country album. Playing for Wounded Warrior events in New York City and at West Point. As a vocalist, it is difficult to whittle down a very long list of influences. There are so many different styles and voice types that have inspired me. As a big musical theater buff, Julie Andrews and Rosemary Clooney are both on my short list. My very first aspiration as a little four-year-old, was to sound like Jodi Benson, the voice of Ariel in The Little Mermaid. Now I pursue the flexibility and range to be the best vocal chameleon I can be! In 2003, I joined the Army National Guard as a vocalist and percussionist with the 38th Infantry Division Band in Indianapolis. I spent 12 years serving the Guard as a vocalist on two Army Soldier Show tours, two Army Birthday Balls, and in three National Guard Bands. Currently, I’m studying photography and videography to better capture amazing moments with the West Point Band. I also work in the social media shop as a representative for the Benny Havens Band. Along with those duties, I serve on the Benny Havens Band Production Team. I also love to bake and have really enjoyed learning the art of sweet treats. I was three years old when I knew music was forever a part of my life. I sang “Come on Ring Those Bells” with my mother at church. I grew up next to the piano singing hymns while my mom practiced for Sundays. I had the privilege of touring with the U.S. Army Soldier Show where I was afforded the opportunity to sing for thousands of troops and their families all over the world. We also sang for wounded combat servicemen and women at Landstuhl Medical Center during their recoveries. Since being here at West Point, I was honored to be a part of last year’s Army Birthday celebration down in New York City. I stood directly in front of Gen. Raymond Odierno (Chief of Staff) and led the U.S. Army Song. I can’t believe I have been blessed to sing for my country for 14 years. Being here in the West Point Band has always been a dream and yes, I’m still pinching myself! After getting introduced to the drums at seven years old by his father and driving his parents nuts practicing, Sgt. Maj. Drewes attended the North Carolina School of the Arts for high school. Shortly after, he moved to New York City where he attended the Manhattan School of Music before moving to Washington D.C., to attend the University of Maryland for graduate school. He then joined the Air Force before winning a job with the West Point Band. Sgt. Maj. Drewes is now the drummer and in charge of the Benny Havens Band, a rock/pop/country group that plays for the Corps of Cadets and audiences around the nation. Many, but right now any mainstream commercial music. …the band stopped playing to feature me and everyone kept dancing. Then, I knew I could entertain people and make them happy. My first Benny Havens Band Cadet Basic Training and Fourth of July concert. Playing for over 10,000 people and the new cadets, watching them go crazy — it felt like hitting a home run! I was born in San Juan, Puerto Rico, and began to play the trumpet at five years old. I come from a family with an old tradition of music. When I was 13, I started to work as a professional musician in the Latin music industry. My music background comes from pop and jazz music. I had the blessing of working as a studio trumpet player and lead singer in the Latin music scene in Puerto Rico, Miami, New York, and all around Latin America. I knew I wanted to be a musician the first time my parents took me to a Latin gig back in Puerto Rico. I was around four or five years old. My dad, who is also a musician, introduced me to a few percussion instruments and a started banging on them. I still remember the joy and feeling going through my veins. Around six months after I arrived to my first unit, the Army Ground Forces Band, I had the opportunity to perform a duo piece with one of my trumpet player idols, Allen Vizzutti. Mr. Vizzutti was invited to play two shows and do a master class with the band, and I was featured with him in a tune called “VizBiz.” I’m always grateful for the Army and the opportunity to do stuff like that at such a high level of professionalism. Watch Staff Sgt. Quinones tell his story in New York City — click here! Born and raised on Cape Cod, Massachusetts, Staff Sgt. Geoff Vidal was steeped in the big band traditions of the 1940’s and 50’s from the age of 15 while playing in a local big band (born out of the National Guard!). He earned a bachelor’s degree in jazz performance from the University of Massachusetts Amherst, where he was awarded multiple Downbeat Student Music Awards. He moved to New Orleans in 2003 where he lived until Hurricane Katrina sent him back up north, this time to New York City, where he remained for 10 years, freelancing and leading his own groups. In 2012, Staff Sgt. Vidal took first place in the first Detroit Jazz Festival Saxophone Competition, ultimately winning a spot at the festival that summer. Staff Sgt. Vidal enlisted in the U.S. Army after winning an audition to become a member of the West Point Band. Teachers include Lynn Klock, Jeff Holmes, Adam Kolker, my wife, and the Buddha. I’d like to think that my playing is comprised of many different influences rather than a distinct few. I recognized early on that depending on the situation, you’re playing changes, and you have to be able adapt and adjust on the fly. Currently, I am co-leading a jazz quartet with my West Point Band-mate Sgt. 1st Class Derrick James. We are playing locally in the Hudson Valley and are developing our original compositions while continuing to honor the great jazz traditions. I do a lot of arranging for the Benny Havens Band, which is a great way to hone my writing chops. I am also the NCOIC of the Cadet Jazz Forum, coaching a jazz ensemble of cadets and area high school students. I’m always working on various solo transcriptions of the masters, as well as trying to build technique on my other horns (clarinet and flute). I knew I wanted to be a professional musician after suffering a terrible sports injury in high school. While I was laid up on crutches for months, I always had my saxophone, and from that moment, the road ahead was clear. My favorite Army performance highlight was opening up for Jay Leno with the Benny Havens Band in a sold out Eisenhower Hall. What a rush! Staff Sergeant Jeremy Gaynor is West Point’s male lead vocalist and an instrumental part of the Benny Havens Band. A native of Tampa, Florida, he comes from a family of military servicemen and women. No longer able to ignore his own call to service, Staff Sgt. Gaynor enlisted into the Army in 2009, receiving an initial duty assignment with the 72nd Medical Detachment at Fort Campbell, Kentucky — 101st Airborne Division (Air Assault). As a vocalist, Staff Sgt. Gaynor has performed in over 150 large-scale stage productions across Europe, Asia, and the continental United States. During assignment with the Army Entertainment Detachment, he performed or managed productions in a wide variety of venues in service to dignitaries like President Barack Obama. In 2014, he joined the West Point Band. Shortly after arriving in New York, he was selected as a contestant on NBC’s “The Voice,” an experience that gave him invaluable insights into today’s music scene. Staff Sgt. Gaynor takes pride in the opportunity to serve his country, his fellow service members, and the local community. In addition to his duties as male lead vocalist, Staff Sgt. Gaynor serves as the band’s Production Manager, choreographing and helping to put on some of the band’s biggest productions. Off duty, Staff Sgt. Gaynor enjoys writing, watching sports, and the joy of life with his wife and young daughter. I realized the power and impact music had to inspire, encourage and uplift.